It’s the simple things in life that really count. Dogs walking on their hind legs, carrots that are shaped like people, pretzel bites... If only there was an option to live on pretzel bites for the rest of eternity! If such an option existed, that’d be it. End of story. We’d all be riding off into the sunset on giant pretzel bites, and the rest of our days would be spent playing “Chubby Bunny,” only we’d use pretzel bites instead of marshmallows. Though, one should really only accept this option if that lifetime supply of pretzel bites was provided by none other than Jack Scalfani. 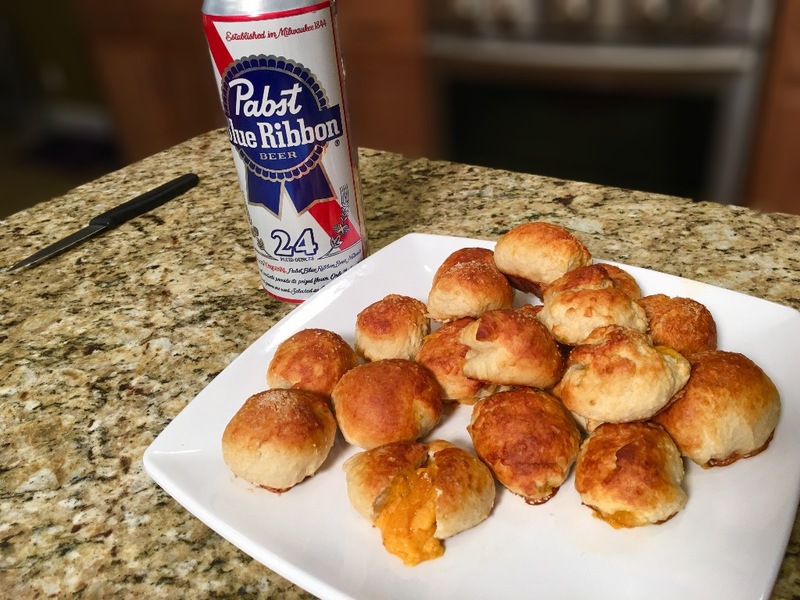 You know him as the guy from “Cooking With Jack” on YouTube, but we know him as the guy who made our dreams come true with his recipe for PBR Sriracha Garlic Cheese Pretzel Bites. 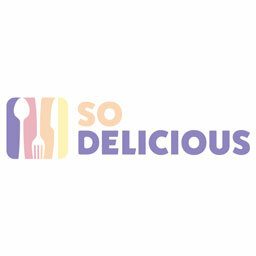 Not only are the intensely delicious, but you can actually make them for yourself, no problem! Just check out his step-by-step video above, and refer to the recipe below. 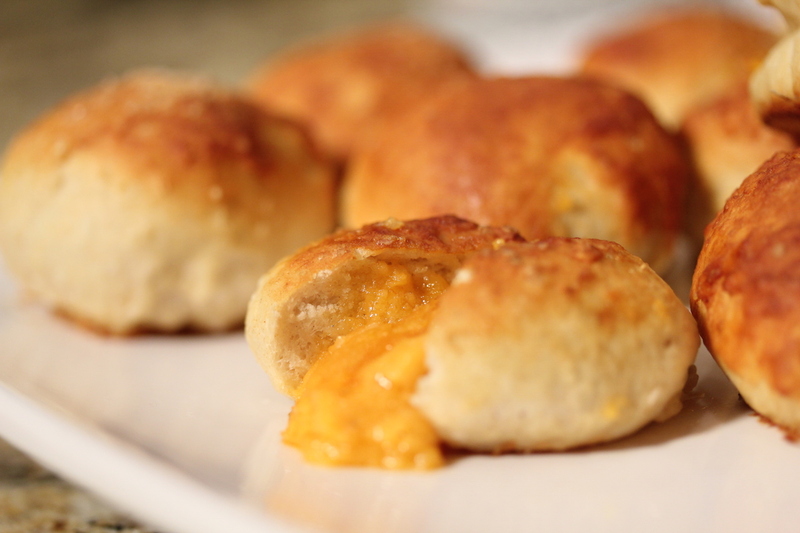 Once you master these on your own, it’s pretty much like you just earned yourself a lifetime supply of pretzel bites. You’ll be able to make and take them anywhere you like, anytime—a sneaky snack for the movies, a lil’ somethin-somethin’ to hold you over until dinner… you know the deal. Now go saddle up on a giant pretzel bite and ride into the sunset. 1) Pour beer into a bowl and whisk until beer loses its carbonation, about 30 seconds. Set aside. 2) Place shredded cheese into the work bowl of a food processor; add garlic, dry mustard powder, black pepper, 1/2 teaspoon cayenne pepper, salt, hot sauce, Worcestershire sauce, and flat beer. 3) Process until smooth and creamy, pulsing a few times, scraping the sides, and blending for about 2 total minutes. Taste and adjust seasoning. If adding more seasoning, pulse a few times to mix. 4) Spoon small dollops of cheese onto parchment paper or Chocolate molds. Freeze solid. 5) Dissolve active dry yeast and 1 tsp. of white sugar into 1 1/4 cup warm water. Let sit for about 10 minutes, until creamy. until doubled, about an hour. 8) When risen, place dough on a lightly floured surface and divide into 12 pieces. Roll each piece into a long rope the cut rope into 1 inch pieces. 9) Roll each 1 inch piece into a ball. Make indention with finger and insert cheese bit into indention. Seal up the ball around the cheese. 10) Dip each stuffed pretzel into the baking soda solution and then place on a greased baking sheet. Sprinkle with kosher salt or cinnamon/sugar. 11) Bake in a preheated oven for about 7-8 minutes, or until browned.